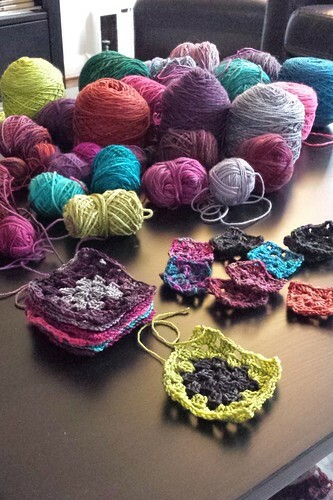 When last I reported on the epic granny squares project, I had happily reached the point where I could start to feel the momentum coming back. Like when you’re running a race and start passing mile markers that show you’re actually farther along than you thought you were, so you don’t have quite as far to go to the finish line as you’d assumed. This weekend, with the bonus of a bit of long-weekend holiday time, I busted through a bunch more squares and am amazed to report that I now have just 20 squares left to go. Full disclosure, this does not include borders or the final assembly – though 180 of the final 304 do already have borders, and several dozen have been partly assembled, so go me – so reaching that 304 number will still mean there is some work left to do. BUT, this is pretty huge. 1. In the beginning I felt a lot more fussy about the colour combinations for these squares. I wanted things to look good, one square at a time, and didn’t want to repeat a lot of combinations if I could help it. Now, 280-ish granny squares later, I can tell you that with this many colours going into the whole blanket, colour combos don’t matter. If I had carefully selected only 5 colours for the whole blanket I would definitely be counting out exact colour combinations to arrange in some specific order. That’s not what this is, though, this is years of leftovers going into the same blanket soup. Some squares will be like brights on acid, some will be morbidly dull, and most will be somewhere in between. The nice part is that choosing a different colour combo every couple of squares is the thing that breaks up the monotony of having to do so effing many of them. 2. If you don’t sew in the ends as you go, I don’t know how you would ever get this far. If you’re starting a big project like this, don’t leave the ends to the end. Don’t do that to yourself. Weave in the ends in batches of 10 squares at a time if you must, bait yourself with chocolate treats or wine if you have to, but please do your future self this favour and weave the ends in as you go. 3. Most of the small-amount colours I started with are now gone. It was sort of wistful when this started happening, but now I see them as goals – oh, that small bit of fuschia is almost done, let’s see how many little centres I can whack out with it. I’m down to just a handful of little leftover balls, and the larger full-skeins or mostly-full skeins I supplemented the pile with are still mostly pretty large. As a result I also don’t regret that I pulled a few of those full skeins from the stash to put into service for this project – I’m glad they’re getting used even partially, rather than continuing to sit un-wound and un-used, or attached to WIPs that won’t be finished any time soon. 4. There is a lot to enjoy about a big project like this, not the least of which is delighting over each pretty little finished square. But it is an enormous commitment, and it has definitely stolen time away from other knitting projects that i thought I would have either started or finished by now (or both). I wish I’d finished a knitted sweater or two this winter. Instead, I have this almost-done blanket. Not that I won’t be glad to have the blanket, but still, there are bargains to be made with any project. Big projects don’t happen in a vacuum, they demand their time and space even if you don’t notice. I hope your week is off to a good start, blog friends. And that you have some unfinished projects getting some soon-to-be-finished attention. Some time ago, I crocheted an afghan to use up my leftover yarn. It was a shell pattern with every other row in black. I tried to have as few color repeats as possible with some success. It was quite colorful when I finished and always got lots of attention from visitors. It was the afghan my son took when he grew up and moved out. He called it “the color DOES matter” afghan! I have so enjoyed following your efforts. You will have no regrets on time and effort. The finish line is just steps away. What are you going to do with this beautiful work of art when done? Oh I think it is worth the time and effort! Think of all the space you have in your stash now! When I did the year of socks knit along I made squares with the ends of all the sock yarn, but I wasn’t as creative as you are being, I just made the whole 5 rows from the same yarn until it was gone. When I finished the Karl I whipped them all together with black and I love that light weight couch blanket. 😀 I think yours will be a much better planned, more useful thing, you should be proud. And weaving in the ends as you go is a very valuable tip! Such prettiness. It must to early in the morning here. My brain was not registering. I was reading your post, and looked at the top phot, and thought what has Easter eggs and chocolate got to do with the blanket. When I looked again,, it was granny sqaures ans2 yarn. Glenna, You’ve taken such an organized approach (along with bulldog determination! ), I look forward to learning how you’ll approach arranging the squares into a pleasing color combination. Seems that could be quite a challenge. Will you lay them all out on the floor and see what works? Use a more calculated color-combo approach? It’s all going to look different, anyway, when you add the white borders … so some of this I guess you’ll just have to wing. But, I look forward to reading the tactics you’ll take. ‘there are bargains to be made with any project’ …right now I am in heavy negotiations with a sweater that is off on row gauge, and therefore is producing too deep armholes. To rip, or to accept – that seems to be the hardened bargaining positions – all within my head! You are spot on about the color issue. Like a scrap quilt, the whole is far more than the parts. And if it’s still ugly, you need to use that yarn/fabric in smaller amounts. 🙂 Looking forward to the finished project, albeit probably not as much as you are. 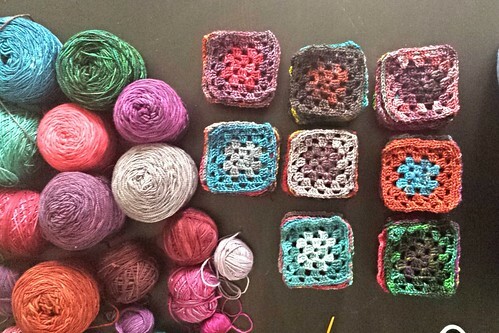 The Granny Square thing: been there, done that, learned my lesson. I still love doing grannies, but all ends are done in when I finish a square. I did a huge one, double bed size lat year, and I was so grateful that I had done that. I also sewed up big sections as I went, and somehow it all works out in the end. I am currently working through my sock yarn leftovers with a pattern called Canal Grande, and it is perfect: whole little balls can disappear in an evening. Highly recommended! 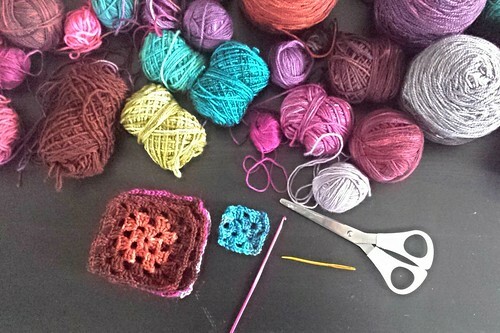 I blame you for the granny squares beginning to appear next to my chair in the evenings. Sigh. This is fantastic. I would love to do something like this with my own stash and leftovers! Can I ask how you manage different weights of yarn? And different fibre types? Are you using only yarns of the same weight and fibre from your stash, or are you working with everything you have? I have a hugely varied mixture, and although I’m sure the colours would all work out nicely in the grand scheme of things, I don’t know that different weights and textures would work quite as well! Oooh, look at all that color!! Can’t wait to see it finished. I so enjoy following your progress updates. I recognise the project emotions too eg sad to use up the stash ends, happy to use up the stash ends! I’ve been keen on mitred squares blankets as there is no sewing/joining apart from those ends! Good luck as you approach the finish.